What can Rajapack customers look forward to in 2018? This time last week we held our annual Supplier Day. This day showcases the new packaging products, packing machines and techniques that our suppliers have to offer, combined with discussion, advice and information direct from the experts. Every year the Rajapack Supplier Day gives our teams the chance to really understand our suppliers, their ethos and their products. Working so closely enables us to have a relationship with them based on trust and shared values. Throughout the day our teams learn directly from the experts, taking their knowledge on board so we can deliver the right products, advice and solutions to our customers. Right from the start, the floor was humming with activity. A atmosphere throughout the day gave everyone the opportunity to listen and learn from our specialist suppliers, an invaluable experience. Seminars were held throughout the day, which allowed suppliers to demonstrate and explain their product and services in detail. Some of the topics focused on included digital print and bespoke packaging, environmental responsibility and to improve customer service with increased client-supplier communication. The aim of the supplier seminars is to help the Rajapack team be better prepared and equipped with knowledge to better answer customer queries. This year, a common theme across all our suppliers was a focus on environmental responsibility and recycling, a topic that is very close to our hearts at Rajapack. The success and popularity of David Attenborough’s ‘Blue Planet II’ series on the BBC has had a huge impact on the UK population, encouraging us to think about the choices we can make when buying and recycling plastics. For many suppliers, corrugated cardboard is a key solution in the fight against plastics and the move away from materials which can’t easily be recycled. Cardboard and cardboard boxes can easily be recycled, while offering many benefits as a packaging material; high strength, crushing resistance, and light weight are just a few. At Rajapack we agree completely, and together with our suppliers we can all be part of the solution to increase recycling and reduce the waste that washes up on our shores. What can you expect from Rajapack suppliers in 2018? All our suppliers contributed on the day in what was a valuable and positive learning experience for everyone. As one of the few distributors of Ranpak products in the UK, we were proud to host them again on the day. They showcased a new product, which they will be launching this year and we will be offering through the Rajapack website and catalogue. The Geami WrapPak Exbox Mini is a wrapping and packaging machine for small operations and retail outlets. Made from a disposable carton expander box, it’s small and lightweight, ideal for operations with limited space. It produces Geami’s strong 3D honeycomb die cut paper, a very strong, robust and eco-friendly wrapping which offers great protection for items and also looks attractive. Another innovative packaging machine that was showcased this year was the AirWave. This small and compact machine produces void fill pillows and quilts. Its ergonomic design combined with powerful performance offers a strong solution for protective packaging, and it’s another cutting edge packaging product that we’ll be stocking this year as part of our RAJASYSTEM range. In the evening, we held our Supplier Excellence Awards, which gave us an opportunity to recognise and award our suppliers for their support across the year. Our Supplier Coach of the Year was awarded to Ranpak. Throughout 2017 they’ve provided excellence in field training, product instructions and we’ve had exceptional feedback from the head office training they’ve hosted for us. The Proactive Supplier of the Year Award went to Jiffy, for proactively providing high quality and regular opportunities to improve RAJAPACK’s product offering, quality and service throughout the year. Winners of our Service Excellence Award this year were Limpet, for their first-rate delivery performance and outstandingly low number of product quality issues. Our Extra Mile Award recognises an individual who has gone over and beyond in their support to Rajapack in 2017, and this year that award went to Mahmood Fakhar at Diamond Box for all of his support and dedication. Finally, our Supplier of the Year award for 2018, which is based on sales performance, training & coaching, proactivity, and innovation went to Reedbut Packaging, manufacturer of corrugated cardboard for all their hard work and support throughout the year. “The annual RAJAPACK supplier day and awards event is now a fixture in the calendar for many of the industry’s leading manufacturers, providing a fantastic opportunity to reflect and celebrate with our key partners on our joint successes from 2017 and to plan for how we will deliver excellent service and quality for our customers together in 2018. This entry was posted in Packaging Industry News on January 25, 2018 by Rajapack UK. For our first post of 2018 we’re focusing on a topic that’s close to our heart – environmental responsibility. We’re all committed to sustainable development to benefit the environment, with an environmental policy in place across all of our 15 subsidiaries across Europe. We regularly launch campaigns to support and help charities around the world and at home. Our current campaign is the Women and the Environment programme which has raised more than £625,000 for charity projects around the world and has been extended until the end of August 2018. More recently we’ve undertaken a survey of over 2,000 people to find out more about recycling in the UK. We also commissioned a cardboard sculpture artist to produce a piece for us to raise awareness of recycling as part of our Art of Recycling campaign. It’s important for Rajapack to help our customers go green too. Moving to more environmentally-friendly packaging offers many benefits for a business as well as being kinder to the planet. It’s great for improving your brand reputation, differentiating your offering in a crowded marketplace and enhancing the experience for your customers. Over the past few years we’ve been steadily growing our range of eco-friendly packaging and below we’ve picked out some of our favourites to help your business go green in 2018. Bubble wrap is one of the most popular types of protective packaging as it’s so versatile. It can be used for a whole range of things including wrapping, layering, separating and cushioning goods to give them great protection during storage or transit. 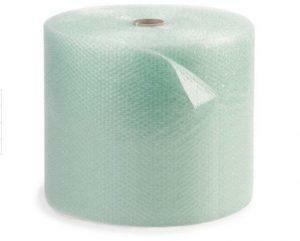 For a more eco-friendly alternative to standard bubble wrap, we offer recycled, recyclable green bubble wrap. Coloured with a slight tint of green and supplied in 100 metre rolls, it’s made from strong green polyethene, 50 microns in thickness. It’s completely recyclable and made from at least 15% recycled polythene for less impact on the environment. If you use a lot of loose fill in your packaging process, then we recommend trying this biodegradable loose fill from Eco-Flo. It’s more environmentally friendly as it breaks down in the environment naturally and is completely compostable. High quality light, clean chips will settle immediately and fit around goods in a box, preventing them from dropping to the bottom, providing solid protection. They are 5 times more antistatic than using polystyrene chips, so can be used for any product from delicate ceramics and china to sensitive electronic equipment or heavy mechanical items. Documents enclosed labels are one of the most common packaging labels, used on all large shipments to identify package details without having to open them. We offer a green alternative, so you can make small, simple changes to your processes to be more eco-friendly without it costing the earth. 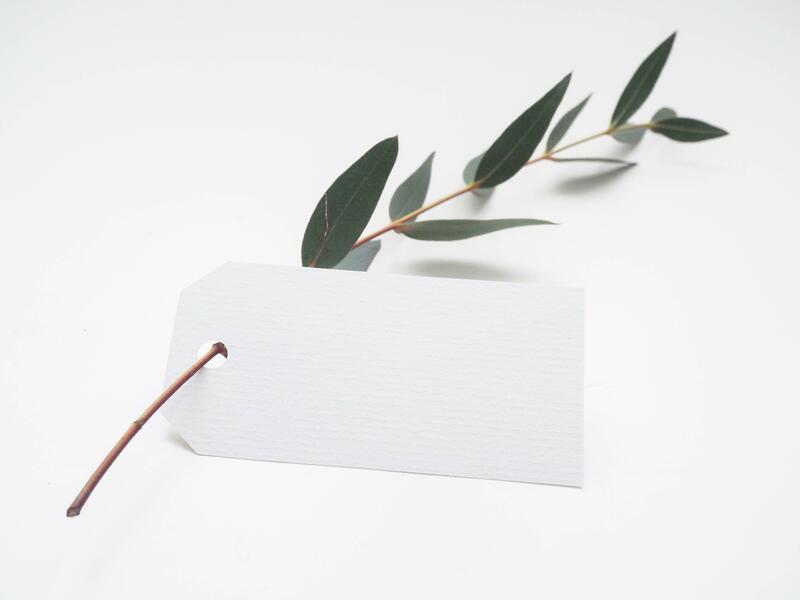 Our green documents enclosed envelope labels are made from 60% recycled materials and are still as strong, sticky and durable as standard non-recycled envelope labels. Available in three sizes; A5, A6 or DL, they’re made from 60 micron polythene with a paper backing and will stick fast to any package. This eco-friendly strapping, made from 80% recycled material is twice as strong as polypropylene strapping and a great alternative to using steel. The extruded polyester is 100% recyclable and features a cardboard core that can be recycled with your standard paper and board. 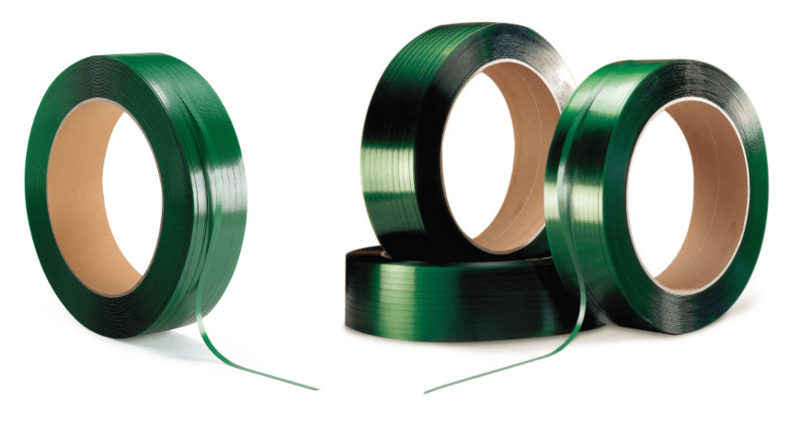 Extruded polyester strapping offers lots of other benefits too; it won’t ever rust, scratch or stain your shipments, and its elastic properties mean that it can fit awkward shapes without splitting or losing strength. If you regularly use strapping in your shipments, we recommend taking a look. Our eco-friendly range isn’t limited to packaging and protection, we also have office and facilities products available too. These cardboard archive box folders are great for keeping your office and paperwork organised. They’re made from 100% recycled cardboard, a single flat sheet of corrugated board which gives a solid finish. Available in four different spine widths, from 80mm to 150mm, they feature pre-ruled lines across all four side for easy identification. They’re completely recyclable too. They’re great for packaging and protecting a massive range of items, from jewellery and cosmetics, to electronics, magazines and more. With brilliant clarity through the bag, they can be used for presenting products too. Made from 100% recycled antistatic Kraft, this crinkle cut shredded paper protects during shipping and looks pretty when presenting gifts and products. The 80gsm natural fibre holds its shape and resists crushing, providing strong protectionyour items. The spiral folded fibres are perfect for presentation in items such as seasonal hampers, fruit baskets, gift hampers and general gift decoration. They’re 100% recyclable too. Made from 100% recycled paper, padded jiffy green mailing bags provide outstanding protection with super strength. If you’re already using mailing bags to send out your shipments, then these are a great eco-friendly alternative. Available in ten different sizes, they can be used to ship a wide range of items including heavy duty products such as mechanical parts. Featuring a 100% recycled paper fibre lining, they are 100% recyclable and offer exceptional protection with their cushioning paper layer. We offer eco-friendly solutions if you ship your goods on pallets, to help you be greener. These moulded wood pallets are lightweight, incredibly strong, and manufactured from recycled waste timber. They’re 100% recyclable too, so you can ensure they get recycled into future products after use. Lightweight and economical, they can easily be stacked when not in use, saving space in your warehouse, and are fully certified for export according to FAO-IPPC-ISPM 15, so there’s no need to fumigate or heat treat them. They’re available in other sizes too, from mini pallets through to container size to fit standard ISO containers. If you’re shipping pallets of goods, then we can recommend a green alternative for export boxes. These cardboard loading cases with optional lids are strong, robust and durable. They’re made from double wall corrugated board with a Kraft paper finish, which makes them damp and moisture resistant, perfect for use in humid conditions. They’re made of 75% recycled fibres and are 100% recyclable. Once recycled after use, they can be remade and reused in just two weeks. 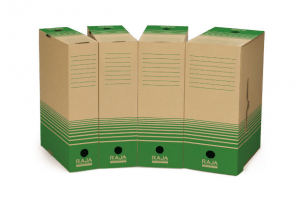 If you’d like to see how our team of packaging experts can help your business be a little greener for 2018, simply visit www.rajapack.co.uk or contact our team on 0800 542 44 28. This entry was posted in Environmental packaging, Packaging Industry News and tagged eco-packaging on January 16, 2018 by Rajapack UK.